Together with the representative of the administration of the President of the Republic of Azerbaijan, Alekper Kuliyev, with the Extraordinary and Plenipotentiary Ambassador of Azerbaijan to the Republic of Moldova Gudsi Dursun oglu Osmanov, as well as with the Bashkan of Gagauzia Irina Vlakh, the Head of State laid the first stone in the construction of the cultural and educational center in Ceadir-Lunga that will be implemented with the support of Azerbaijan Foundation named after Heydar Aliyev. "The agreement on the construction of this center was reached during my meeting with the President of the Republic of Azerbaijan Ilham Aliyev, which took place last summer during my official visit to the Republic of Azerbaijan. 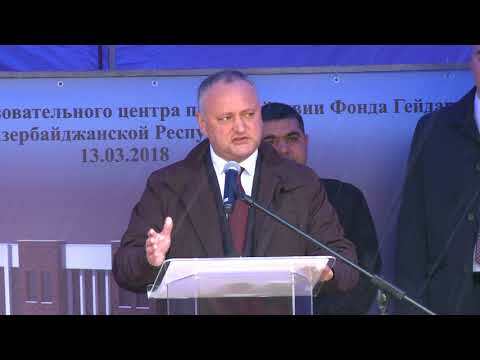 I expressed hope that the head of the Azerbaijani state will be present at the solemn opening of the center, which is planned this fall," Igor Dodon said. The new center will host music and art school, Children's Creativity Center, and Association of Folk Craftsmen. The Azerbaijani side chose the plot where construction will be carried out. "I express deep and sincere gratitude to the Republic of Azerbaijan for assistance in the construction of this facility, which will serve for the development and promotion of the national culture of both Gagauzia and the Republic of Moldova as a whole," the Moldovan President said.